Sania Mirza and Martina Hingis reunited after briefly splitting this year only for the purpose of defending the WTA Finals title that they won last year. The reunion initially seemed to have brought back the sizzling chemistry that they shared for 17 months together when they reigned supreme, winning three Grand Slams and 11 other titles. They began their title defense at Singapore this year with a hard-fought 7-6(10), 7-5 win over the Chinese Taipei pair of Hao-Ching Chan and Yung-Jan Chan that helped them progress to the semi-finals. Their opponents in the last-four stage were the experienced pair of Ekaterina Makarova and Elena Vesnina, who won the 2016 Rio Olympic gold medal. Having never lost to the Russians, the very popular Team Santina started off the semis on a confidence note on Saturday. 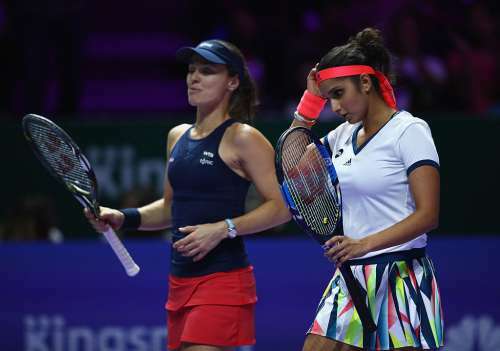 Mirza and Hingis broke the Russians for a 2-0 lead and continued to put pressure on them as the two-time Major winners struggled mightily on their serves. Makarova and Vesnina found some form back and did make in-roads into Team Santina’s serves twice but they could not sustain it for a long time. The Indo-Swiss duo broke twice more to clinch the opener, 6-3. If their fans hoped that this will be a quick win for the former top-ranked pair, they were in for a shock for Mirza/Hingis flattered to deceive. They could no longer find their spark from the start of the second set and their games were mired in a host of unforced errors. That only galvanized the comeback of the Russians who simply soared with confidence as the set wore on. They broke their nemeses thrice and won the second set 6-2 to take this crucial encounter into a match tie-break. The tie-break was competitive till 2-2 after which the Russians grabbed a mini-break to march to a 4-2 lead which they extended to 8-4. Hingis found her magic backhand to reduce the deficit to 6-8. But they could not do much afterward as Makarova and Vesnina pounced on the opportunity to take the 3-6, 6-2, 10-6 win in 1 hour 30 minutes. In the final, the Russians will meet the third seeds Bethanie Mattek-Sands and Lucie Safarova, who upset the top seeds Caroline Garcia and Kristina Mladenovic, 6-3, 7-5. Interestingly, the fate of Mirza’s No. 1 ranking now remains in the hands of the very pair who beat them on Saturday. If Makarova/Vesnina defeat the US Open champions Mattek-Sands/Safarova, the Indian will retain her numero uno ranking. Otherwise, Mattek-Sands will rise to the pinnacle for the first time in her career. Earlier in the singles matches, the seventh-seeded Dominika Cibulkova showed tremendous guts and resilience to stop the march of the highly experienced Svetlana Kuznetsova, 1-6, 7-6(2), 6-4. Cibulkova, who reached the 2014 Australian Open final, made her WTA Finals debut this year. The third set was a topsy-turvy affair where the drama reached its peak. It was the Slovak who jumped out to a 2-0 lead following which she lost four straight games to trail behind, 2-4. But it was her conviction and desire that helped her raise her level once more to break back for 4-4. She found herself in a dangerous situation while serving in the ninth game where she stared at two break points. However, she did manage to ward them off by making the 31-year-old Kuznetsova run from side to side before breaking the Russian for the win. In the second singles match of the day, it was a supreme performance from the top seed and World No. 1 Angelique Kerber, who stamped her authority over the second-seeded Agnieszka Radwanska, 6-2, 6-1, thus ending the Pole’s title defense. The Australian Open and US Open champion Kerber earned as many as seven breaks of serve in this contest to advance to her first ever final at this prestigious season-ending championships. Kerber and Cibulkova have already played in this event just a few days back in the round-robin stage where the German southpaw emerged a winner in three sets.